Your guests are sure to be big fans of these delicate cherry blossom design silk folding fan favours. 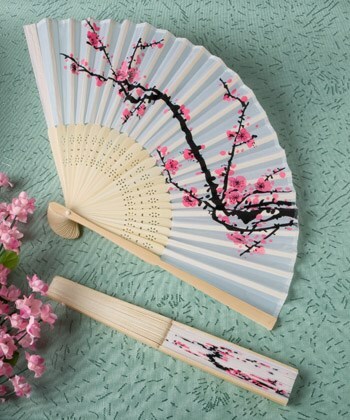 Brilliantly displaying a cherry blossom branch - a traditional symbol of true love - these fan favours are simply sensational. A pretty and useful choice as beach themed favours, destination wedding favours or for any summer event, each 8.25" silk and wood folding fan has an intricately carved light wood collapsible ribbing structure and an attached outstretched white silk fan with a traditional pink and black cherry blossom branch design. Compact when folded and a breath of fresh air when opened, each cherry blossom design silk folding fan favour comes in a white box.